The two greatest scientific breakthroughs of twentieth century, if we measure by increased life expectancy, were improvements in our ability to kill microorganisms (drinking water disinfection and the invention of antibiotics). Perhaps as a remnant of these advances, it seems to me that the average citizen has a largely abiotic mindset, seeing microorganisms as agents of disease, and something that should be eradicated. However, we are learning that we can’t kill them all, and trying to has severe negative consequences; for example, the formation of disinfection-by-products. The probiotic mindset that I reference is not one that sees all microorganisms as good, but rather sees microorganisms as ubiquitous and largely benign or even beneficial. The project I lead at the University of Pittsburgh is investigating the shift in the microbial ecology of hospital premise plumbing following the addition of an onsite disinfection system. When I discuss this project, most people are shocked to learn that drinking water has an appreciable amount of microorganisms present. However, after some explanation, the majority of people cautiously accept my word that drinking water can contain microbes and be safe. This idea is best explained in the fantastic paper by the Dr. Amy Pruden led, Sloan Foundation funded team entitled Probiotic Approach to Pathogen Control in Premise Plumbing Systems? A Review (doi: 10.1021/es402455r). This paper makes an extremely compelling argument that we should not attempt to sterilize drinking water systems (or pretend that they are sterile), but rather that we should design them to promote a microbial ecology that is antagonistic to opportunistic pathogens. One hurdle to bringing this reality to fruition that the paper raises is public acceptance. I agree; in fact, I see public acceptance as the primary hurdle that must be overcome. Now that a common vision is emerging — a probiotic approach to premise plumbing system design — researchers will be able to fill in the necessary knowledge gaps to make this vision a reality. However, moving from research papers to building design is going to take serious public buy-in, especially if it involves encouraging microbial growth in the water system of a new (and expensive) building. 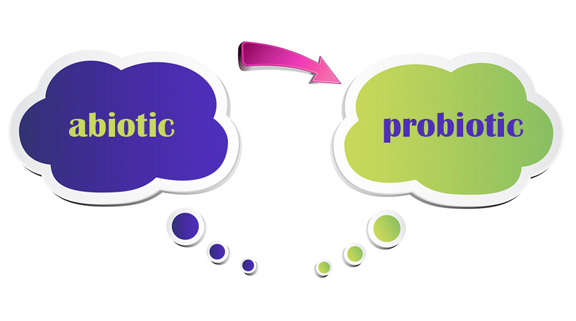 In my opinion, the shift in public mindset from abiotic to probiotic is not impossible, it does not have to be slow, and the time is ripe for this progression to take place. Through my discussions, I have witnessed that the ‘abiotic mindset’ is not as deep seeded as it may seem. As researchers, I believe the best thing we can do is build up quality work supporting the importance and impact of microorganisms in the built environment, and to make sure that this work reaches the public domain. As citizens, we can be tireless advocates in advertising the science behind this improved understanding, and stamping out misperception where we see it. I don’t know all of the steps that will be necessary to catalyze this shift in public perception, but I do know that a change in mindset will be necessary before we see this research being applied in new buildings. This issue touches many areas of the Sloan MicroBE program and a great part of the blog format is that it enables us to continue this discussion. I welcome comments and discussion, both for ideas as to how to move public perception towards a more probiotic mindset, and proof that we are on our way. Kyle Bibby is an Assistant Professor at the University of Pittsburgh in Civil and Environmental Engineering and Computational and Systems Biology. You can reach him on twitter (brand new! ): @Bibby_Lab or email: BibbyKJ@Pitt.edu. One area that needs remedial help moving away from the abiotic mindset is the realm of food safety, as exemplified by the FDAâ€™s proposed produce rule, mandated by the Food Safety Modernization Act to be â€œscience based.â€ While not directly related to the built environment, the same questions of perception of abiotic mindset vs. probiotic mindset apply. The entire proposed rule is based on the idea that microbes are bad and need to be killed in their entirety to ensure a safe food system. For example, the FDA literally proposes that it is safer to heat & ammonia treat manure to try to kill microbes than it is to compost the stuff. Comments made by folks with academic credentials speaking in support of the probiotic mindset would be much appreciated by those of us whose farming practices knowingly rely heavily on beneficial interactions with microbes. The local foods movement may well be a means to help shift public perception in the desired probiotic direction, assuming it weathers attempts by the FDA to force food production in the opposite direction.